1898: Trofim Denisovich Lysenko is born in Karlovka, Ukraine. As dictator Joseph Stalin’s lapdog and top scientist, his influence will almost single-handedly retard the course of Soviet science, especially the fields of genetics and agronomy. Early Soviet propagandists often relied on “miracles of science” to boost the status of their fledgling state. 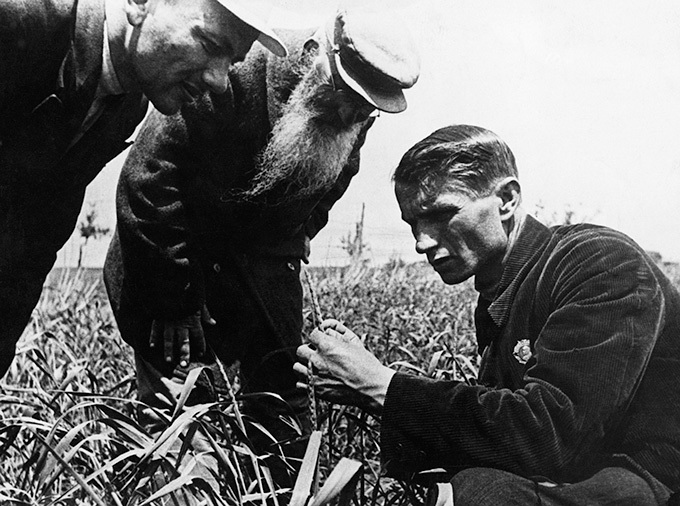 The young plant breeder Trofim Lysenko seemingly provided them with a whopper in 1927, reporting that he had developed a method of fertilizing fields without actually relying on fertilizers or minerals. The spinmeisters at Pravda had a field day, proclaiming that Lysenko had delivered on the Stalinist dream of using science to conquer nature. the barren fields of the Trans-Caucasus green in winter, so that cattle will not perish from poor feeding, and the peasant Turk will live through the winter without trembling for tomorrow. In fact, Lysenko’s methods were practically devoid of any science at all, and the “peasant Turk” continued to go hungry. But in a country where Joseph Stalin determined the truth and famine was ever present, the efficacy of vernalization was not to be denied. Top agricultural officials warmly embraced the process, and the tightly controlled state press dutifully pronounced it another miracle of Soviet science. Except for the fact that crop vernalization didn’t work, it was, indeed, a miracle. Lysenko’s star was definitely on the rise, thanks to officialdom’s alarming ability to ignore the facts in order to obtain the desired results. He also came to Moscow’s attention because of his talent for rallying the country’s peasantry, a surly segment of the population openly hostile to Stalinism. The hostility was thanks to Uncle Joe’s forced collectivization of small farms, which caused widespread starvation and the deaths of millions. Lysenko, the semi-educated son of peasants, was able to put a human face on the regime back in the Kremlin. He spoke the peasants’ language and reassured them that science would fix everything. He became a darling of Stalin’s, and after the dictator delivered a speech placing ideological needs above scientific research, Lysenko’s ascent was swift. In the early 1930s he was appointed head of the Academy of Agricultural Sciences and became the de facto arbiter of all the sciences, a mini-commissar, if you will. It was a catastrophe for Soviet science. The little scientific theory absorbed by Lysenko came by way of Jean-Baptiste Lamarck, the early–19th-century French biologist who promulgated the theory, later refuted by Darwinism, that acquired characteristics could be passed from one generation to the next. This fit neatly with the Stalinist idea that nature could be manipulated to suit the needs of man. Lysenko was hot-tempered, and he brooked no criticism of himself or his work. Legitimate Soviet geneticists and other scientists who dared oppose him often learned this hard truth with a one-way ticket to the gulag. Lysenko, in fact, despised his more-learned colleagues in a way that only a complete fraud with near-absolute power can. He mercilessly rooted out perceived enemies of the state in what amounted to a crusade against science. With Stalin’s blessing, thousands of lab coats were shipped to Siberia, and hundreds died — or were killed — in the camps. In his own way, Lysenko proved to be as destructive to the Soviet Union as Stalin was with his purge of the Red Army officer corps. For as long as Stalin lived, Lysenko was untouchable. After the dictator’s death in 1953, and his subsequent denunciation by Nikita Khrushchev at the 20th Communist Party Congress, Lysenko gradually lost influence. Although he held on to his offices for a time, scientists could now criticize him openly without fear of retribution. They did, with esteemed physicist Andrei Sakharov delivering the most withering blow in a 1964 address. That same year, Lysenko saw his theories officially discredited and discarded by the Soviet Union. He was stripped of all his privileges, no small price to pay in Soviet society. In spite of everything, he kept showing up for work until his death in 1976. Lysenkoism is the man’s legacy, a word synonymous with bending of facts to suit a state ideology. A few years ago, harsher critics of the George W. Bush administration’s science policies evoked the name of Trofim Lysenko, without irony.